Seriously, could someone tell me where today went because it flew by so fast that I missed it! I have been in meetings all day without a moment to spare so I’m exhausted and ready for tommorow to be Friday. It’s nice in some ways, though, because it makes the weekend get here faster when the days go so quickly. Anyway, I wanted to show you my sock in progress. 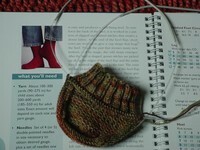 It’s not much yet, but I’m working on the gusset decreases. This is my second pair of socks and only the first I’ve done from the top down. I thought I needed a practice run before working on my Sockapalooza Socks. These are made with Koigu KPPM that my first secret pal, Chris, sent me (so it’s stash yarn, yay!) and will be cycling socks for the husband. I laid it out like this and thought it looked like a smiley face, do you see it? I hope this smiley sock and other small things can bring a smile to your face on a day marked with the attacks in London. My prayers and sympathies go out to those more directly impacted by this unthinkable event. I may be commenting twice here, but the socks look fabulous! Have a wonderful weekend! Hi, my name is HEJ and I am like 10 stitches short. But I am catching up! The yarn stash is very organized, I just did that too! Pics to come. I love the sock color. The boy will larve it, methinks.